Before determining what you're going to place in each drawer and how it will be organized, line it! Drawers in different areas of the home require different types of liners. In the kitchen, select a liner with some padding or texture that is also easy to wipe clean. In the office, you may opt for a more decorative liner. Scented liners are ideal for bedroom and guest room drawers. To contain spills, choose a thick plastic liner for bathroom drawers. Keep in mind the location of each drawer when selecting a system. Drawer organizers for office, closet and bedroom can be made of natural materials like woven fibers, fabric or wood since they will be less likely to be exposed to moisture, water or stains. Kitchen and bath solutions should typically be plastic, metal mesh or stainless steel so that they are easy to wipe down and keep clean. For clothing drawers, leverage the drawers' depth by selecting modular organizers with higher sides for organizing bras, underwear and folded T-shirts. For storing folded intimates, you may select a fabric-lined organizer that will be gentle to delicate fabrics. A scented sachet is always a nice touch! 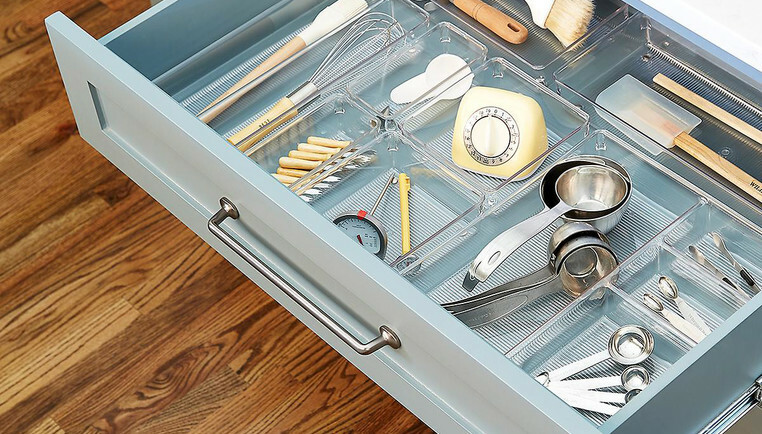 Place utensils, gadgets and tools that you use most frequently in the drawers closest to your kitchen workspace. Lower drawers should be reserved for your least-frequently used items like BBQ essentials or entertaining pieces. If you are short on time and have somewhat standard cutlery to organize, pre-formed trays are easy and efficient. Expandable organizers take advantage of every inch of space from side to side. If you have an odd-shaped drawer or items of many different sizes to store, modular organizers are the best solution. With these organizers, you can divide the drawer to fit what you are storing, creating a totally customized solution. In the office, select a designated area within each drawer for each office supply. This allows for quick accessibility and also for quick transport of supplies to other areas of the home for work or craft projects. It also lets other family members know exactly where an item can be found or replaced after each use. When organizing bathroom drawers, group like items together such as make-up, cleansers, cotton swabs, cotton balls, brushes, combs and hair accessories.